It was a little after 3 pm and it was still pouring outside. I discover many positive sides of owning my own business every day and one of the latest is that I get to choose the time I go home. With the flood warning going on, I did not think anyone will come to visit the gallery. Not that I had any visitors without flood warnings-after all, I am not officially open yet-. I packed up my things after the meeting with an artist, and left early. My eye lids felt so heavy, and the density in my brain was thicker than the rain clouds in the sky. My week was full of meetings, installing shelves with my dad, preparing for my up-coming yoga class, and shopping for supplies I needed for the shop. I was doing all of that while I was working 5-1o am shifts at the coffee shop. My days were starting at 3:30am and ending at 9pm. I need to pace myself, I thought, but then again, my hearts said something else. I have been solitary enough. It is time to give myself to others. And I need to make sure that it is not ‘me’ I am giving them. I am going to give them what God gives ‘me’ so freely. Freely I will share the love, joy, happiness, and healing I have received from the Most High. That was the resolution I made on my drive in the pouring rain. I felt like I had so much love to offer. The more I wanted to offer the world, the more I felt the Love God was pouring down on me. Grace was happening. I have put two books on the middle of the display shelf. “Grace happens here” by Max Lucado is one, and “The Way of the Heart” by Henri Nouwen is another. I put them there because these two books said exactly what I had in mind when I started this gallery project. I wanted the gallery to be a place where grace happens. I knew that grace was at the center of it all, because I could not have started this project without His grace. This was not my work at all. Every one knows that I lack the mental health(bipolar), and the budget(I am a part-time barista). I don’t even have the right connections(I just moved to this town two seasons ago). But I can tell you what I did. I pursued what my heart told me. I followed my heart. Over the years, I made many mistakes while I was learning to discern the messages my heart was sending from the messages my brain was sending. Eventually, by the gift of faith, I slowly learned to discern the voice of God. When I was ready to act in His will, I received another gift. He gave me courage to start what He willed. My heart is a constant battlefield of good and evil. Light and darkness fight there all the time. But I have learned through my own mental illness and spiritual struggles, that as long as I let the light and love win over the darkness and evil, I would not stray from the good path that God is leading me on. It might take patience and endurance, a lot of tears and pains, many separations from the ones you love, and many stormy dark nights of your soul. But eventually, God delivered me to the destination He desired for me. He led me to the place where grace happens, where I will continue to listen to His voice and live by the way of the heart. 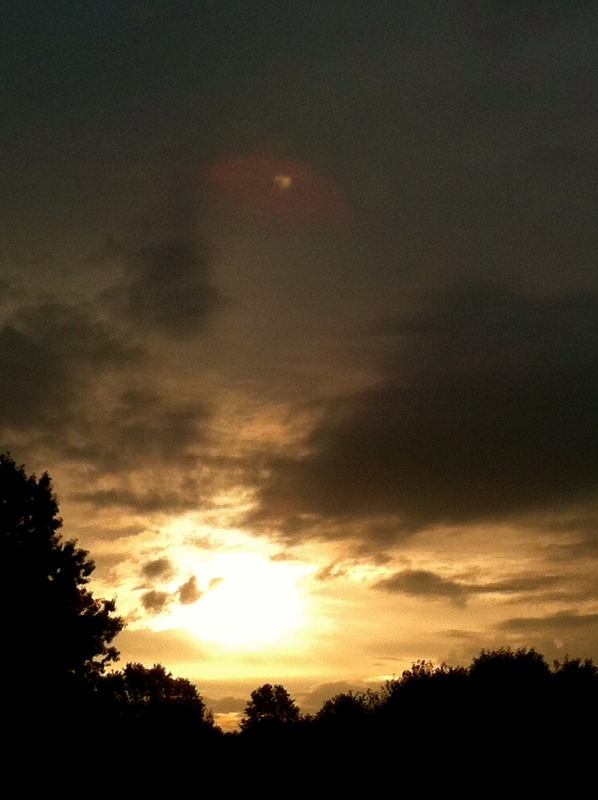 After my morning run, I saw a beautiful sunrise. The heavy rain from the day before was long gone, and it was a clear spring day again. I walked to the back of the building and sat near the stream. I lifted my gaze to the rising sun and muttered in silence as I could not stop the words coming out of my heart. Every knee shall bow before you. And at that moment, I could almost see the day when every knee is humbly bent in honor of His Son, Jesus Christ. I knelt right there and then, and I praised His great grace and glory. I thanked Him for giving me another another day to believe, to love, and to hope. Previous Post Will You Let Love Be Loved? When I was starting out in my own business, one prayer that I kept repeating was: “Lord, You must increase; I must decrease.” Those are the words of John the Baptist. I continue to work hard to build my business but I know that everything depends on God’s grace. Work hard, lilyboat, but leave everything in His hands. Congratulations!